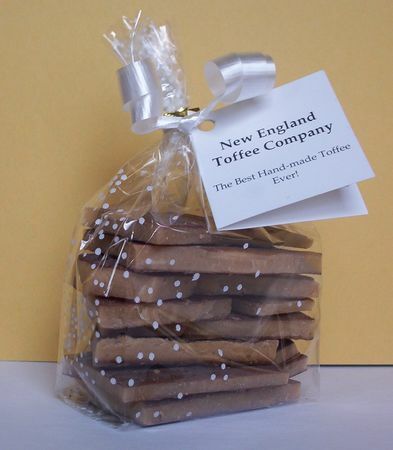 Gourmet Toffee Favorites - the best of the best! This page includes favorites from our catalog items. It is intended for the buyer who wishes to make a quick purchase and prefers not to spend time choosing bag styles, ribbon colors, etc. 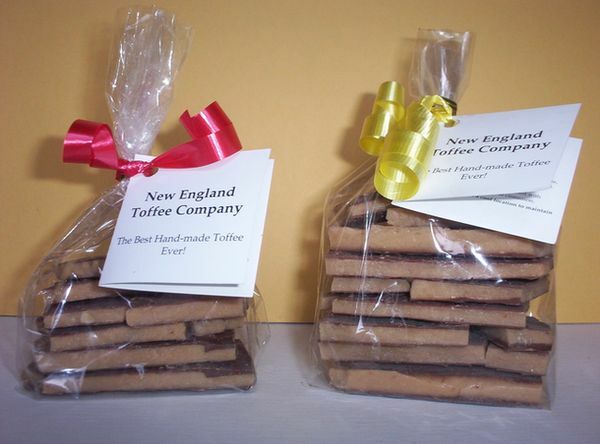 So, choose toffee in our most popular boxes or bags, or as part of gift basket/container. Our candy boxes are one piece boxes with a glossy white exterior. While they are FDA approved for direct food contact, we wrap the toffee with a cream colored food tissue and close it with a gold foil seal. Encircled with a ribbon or bow (larger sizes), these elegant all-occasion boxes of toffee sell for $11.75 (1/2 pound), $23.00 (1 pound), $33.00 (1-1/2 pounds) and $75.00 (4 pounds). This 4 ounce clear cello bag of toffee is available in your choice of 10 flavors. The cost is $5.00. This clear cello bag of toffee holds 8 ounces of one toffee flavor, or 8 ounces of assorted toffees for $9.75. 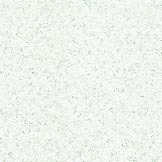 This 8 ounce cello bag is clear with white sprinkles. Choose one flavor of toffee, or choose from our assorted toffees for $9.75. Fill a 1 pound clear cello bag with any one flavor of toffee, or with your choice of assorted toffees for $19.00. This primary dots cello bag is a clear bag sprinkled with red, blue, yellow and green dots. 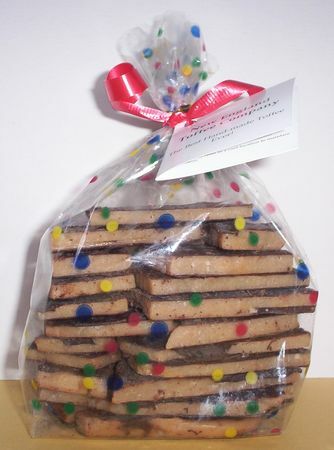 Choose any one flavor of toffee, or from our assorted toffees for $19.00. 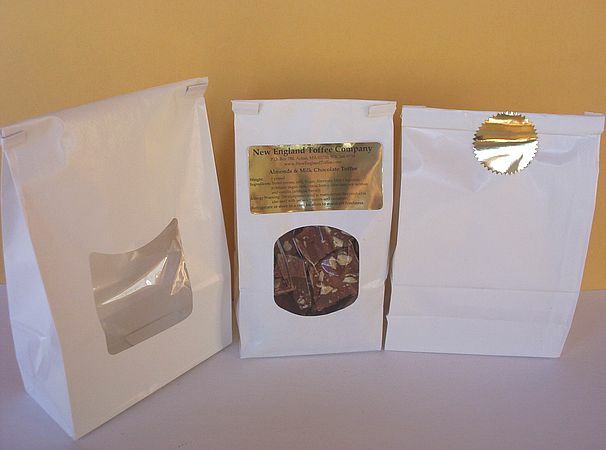 Fill this 1 pound white tin-tie bag with any one flavor of toffee, or with your choice of assorted toffees for $19.00. Each mug comes with a 4 ounce clear cello bag of toffee. The mug/toffee is wrapped in a clear bag and tied with a ribbon. Choose your toffee and then select a mug for either $12.00 or $15.00. 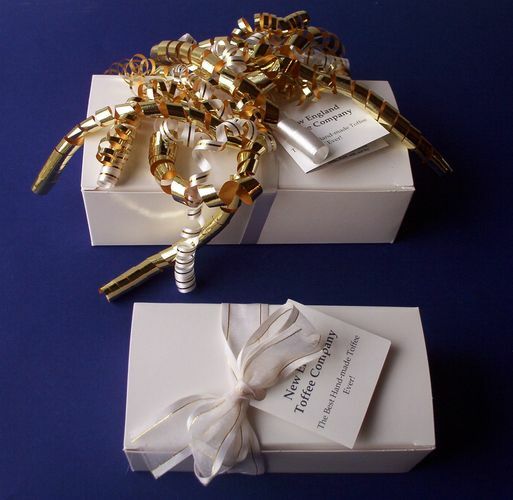 Add gift box, gift wrap and a card for $4.00 more.